3 - 4................Eick vom Eschenhof. 4 - 4................Gisa von Frankenland. 5 - 4................Satan von Ellendonk. 5 - 5................Kira von Romberg. Yago von Bayern passed the ZTP with 1A rating for character and SG for conformation. His sire, Puck von Bayern, passed the Körung with Körklasse 2B rating plus winner of numerous show titles while his dam, Kessy vom Pfaffenberg, passed the ZTP with 1A rating for character and SG for conformation. Eiko: SchH 3, FH, DV-DM participant, Vice ÖDK-Leistungssieger in 1999 and passed the ZTP with 1A rating for character and SG for conformation. 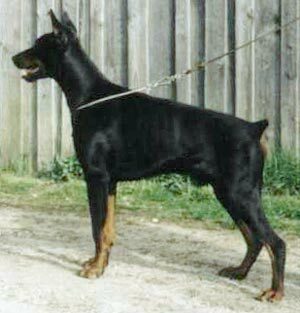 He is sire of the vom Aurachgrund	“G” litter (Granit, Gipsy). Ingo: SchH 3, FH, IDC-WM participant and passed the ZTP with 1A rating for character and SG for conformation. He is sire of the Ascomannis “I” litter (Igor, Indy, Ingo, Ischa). Jano: SchH 3, FH, D.V. Leistungssieger in 2003 and passed the ZTP with 1A rating for character and SG for conformation.